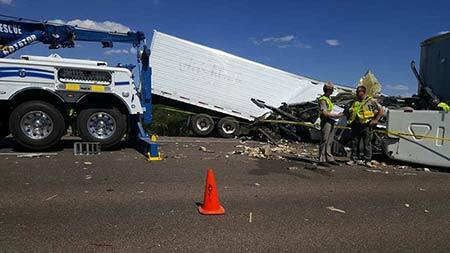 Tucson, Arizona—An accident on Interstate 10 involving two commercial trucks, an SUV and a pickup truck claimed the life of one of the drivers, according to Arizona Department of Public Safety accident investigators. At about 12:30 P.M. on Sunday, a commercial truck carrying a load of produce was headed east on I-10 near Red Rock, just south of Picacho Peak. Ahead of it was a pickup truck towing an SUV. The commercial truck struck the rear of the SUV, causing it to become disengaged from the pickup. The unattached SUV continued onto the median where it came to rest on its side. The pickup ran off the road to the right and rolled. The commercial vehicle traveled across the median into the westbound lanes of I-10. 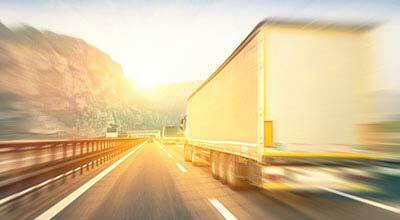 An oncoming semi-truck carrying machinery struck the trailer of the commercial truck. The trailer jack-knifed and landed on top of the cab of the westbound semi, killing its as-yet unidentified driver. The driver of the first commercial vehicle was transported to a trauma center for treatment of his injuries. The driver of the pickup towing the SUV was not injured. We extend our condolences to the family and friends of the driver who died, and we wish a swift and complete recovery for the other driver.